Protester burns her tax bill as demonstrators take over street outside 400 Monroe, where Wayne County Treasurer Raymond Wojtowicz has HQ. 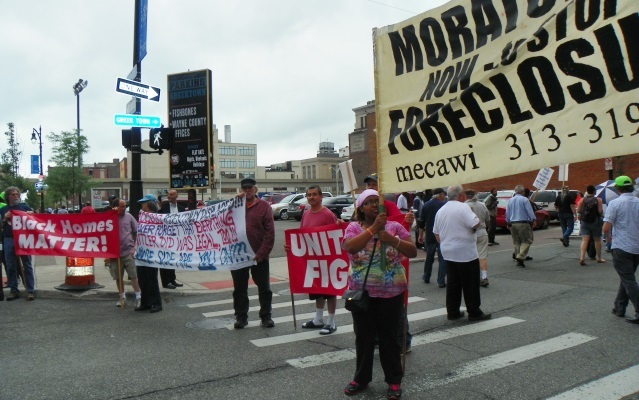 Many protesters demanded immediate re-assessments of property values in Detroit, which have not been done for 20 years during which neighborhood conditions drastically deteriorated. State law requires annual re-assessments, so protesters said taxes people have already paid are illegal and should be paid back. 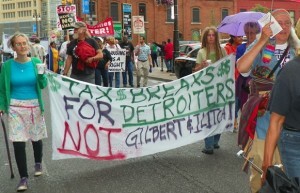 They also said water bills attached to Detroiters’ tax bills should not force foreclosures either. 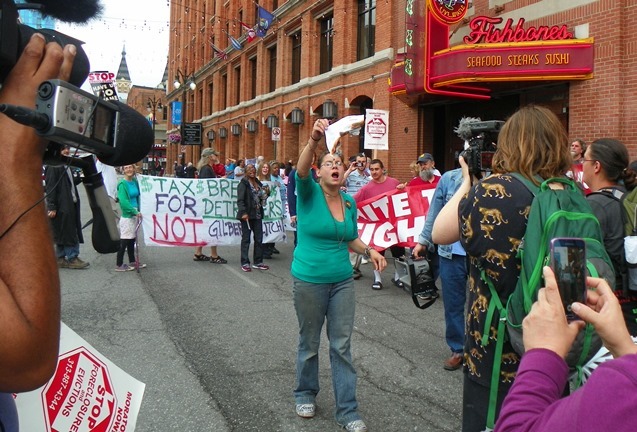 Protester demands that tax re-assessments, not done in Detroit for 20 years, be made retroactive. “Re-assess all taxes now!” they chanted. 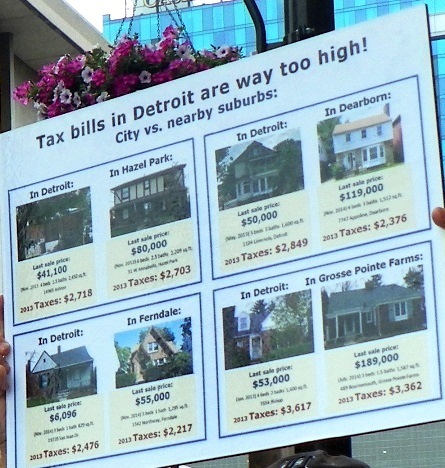 Tijuana Morris pointed to a sign held by Bob Day of Detroit Eviction Defense, which graphically displayed the huge disparities between property taxes charged in Detroit, the poorest city in the country, and those paid by homeowners in Grosse Pointe Farms, Dearborn, Ferndale, and Hazel Park. Tax bills in Detroit way too high; poster compares home values and taxes in Detroit and suburbs. After blocking Monroe for an hour, the crowd marched to the Detroit Water Board building on Randolph to demand a halt to re-instituted water shut-offs and related foreclosures. They swore to return to the treasurer’s office soon, saying that next time they would not leave. 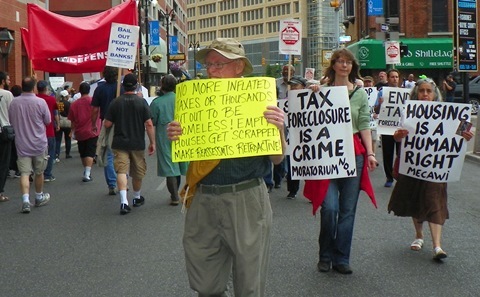 Protesters timed the action to coincide with Wojtowicz’ arbitrary deadline for homeowners to apply for interest reductions on unpaid taxes, allowed under a new state law. 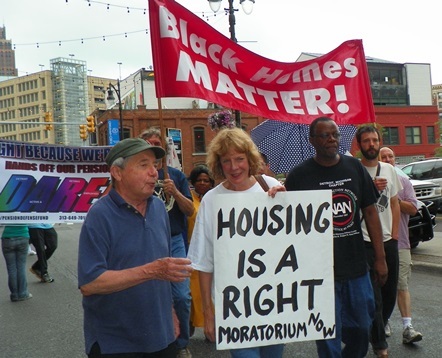 Groups including Detroit Eviction Defense, Moratorium NOW!, the Detroit Active and Retired Employees Association (DAREA), National Action Network, the Russell Woods-Sullivan Neighborhood Association, and many more took part. The protest also coincided with a battle between Wayne County Executive Warren Evans and the Wayne County Commission over how a $49 million debt to the county’s pension fund, mandated for immediate payment by the Michigan Supreme Court, will be paid. Evans wants a one-time property tax increase, while a majority of Commissioners voted June 5 to take the debt out of the Delinquent Tax Revolving Fund (DTRF). Evans vetoed their decision the same day. Commission Chairman Gary Woronchak wrote back that the body will likely take a vote to override the veto in several weeks. Banners form barricade across Monroe to keep police out. 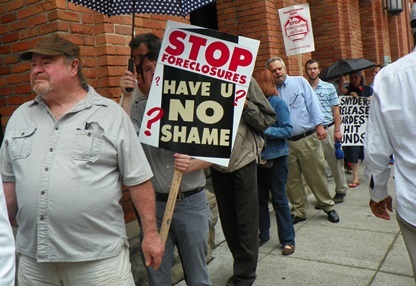 Either way, homeowners lose, because the revolving fund is there to help delinquent taxpayers avoid foreclosures. Have you no shame? 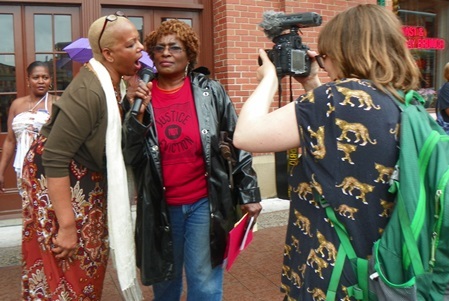 protesters ask Treasurer, county officials. The County builds the fund by borrowing money from the banks, based on delinquent taxes owing in all its municipalities. Thus it can actually pay the taxes of foreclosed homeowners directly. However, the funds are disbursed at the Treasurer’s sole discretion, according to the attached document from the Michigan Association of County Treasurers. Evans claims the DTRF must be used to pay off the county’s structural debt instead, although Wojtowicz earlier used it to pay off $4.5 million for the expansion of the first floor at 400 Monroe, where the Treasurer has offices on several floors. The County does not even own the building. “Ain’t no power like the power of the people, and the power of the people don’t stop!” chant leaders call out. 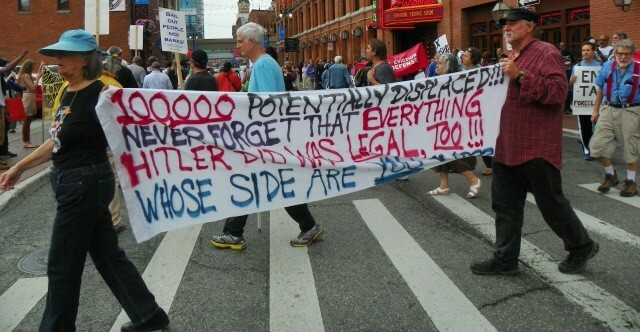 Under Public Act 436, Michigan Gov. Rick Snyder could institute a takeover of Wayne County, as he has done to Detroit and other majority-Black cities, if it does not produce a deficit reduction plan acceptable to the state. Wayne County is 39.6 percent African-American, contrasting with the state’s 14.3 percent Black residents, according to recent census figures. Just as it did during the Detroit takeover and ensuing bankruptcy, Wall Street has been campaigning to get their debts paid first, before the needs of the people. Such a provision is actually part of the Detroit bankruptcy Plan of Adjustment. 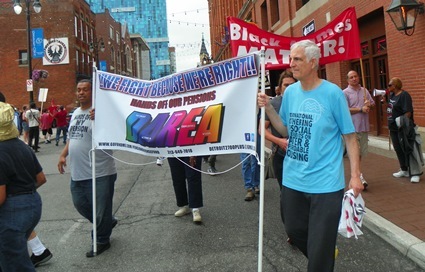 Detroit retirees attended to warn county of disaster that bankruptcy caused; Detroit Active and Retired Employees Association (DAREA) is among 8 groups appealing to federal circuit court. 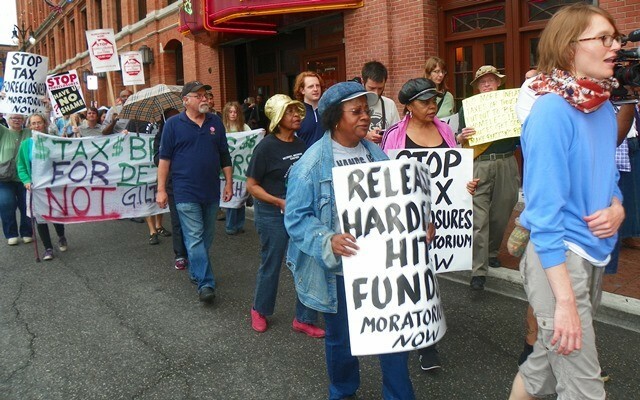 Wall St. is now attacking county workers and pensioners as well, downgrading County bond ratings to rake in profits. In February, Wall Street ratings agencies Moody’s and Standard & Poor’s downgraded the county’s general obligation limited tax (GOLT) debt by three levels to junk, meaning it will be forced to pay higher interest rates on any new debt. “We expect the county’s current liquidity position will remain sufficient to meet all obligations in the coming year, but will continue to degrade absent significant operating adjustments, the implementation of which could be challenging,” Moody’s said. The County cited decreased property tax revenues, “unsustainable” defined benefit pension plans, health care inflation, and overspending in the Wayne County Prosecutor and Sheriff’s offices as responsible for an expected deficit this year. For the last three years, the County has run annual deficits of $50 million. Its total long-term debt is $5 billion. In a move fraught with danger for County residents and workers, the County has hired the accounting firm of Ernst & Young to assess what can be done to cut the deficit. State, county and city governments have given multi-billionaires Dan Gilbert and Mike Illitch hundreds of millions in tax dollars, tax breaks. Ernst & Young met with Detroit’s City Council in a closed session in November, 2011, after which it claimed, falsely as it turned out, that the city would run out of cash by June, 2012. That marked the beginning of the city’s slide into a state takeover under the EM law and a bankruptcy that has stripped Detroit of most of its major assets including the Detroit Water and Sewerage Department, and impoverished its workers and retirees. Meanwhile, Wall Street got the city’s long-term debt load increased from $1.1 billion in 2013 to over $3 billion post-bankruptcy, increasing profits for the banks. The states of New York and New Jersey have sued Ernst & Young for losses they incurred during the crash of 2008, which began with the downfall of the global Lehman Brothers bank. Ernst & Young was the accounting firm for Lehman Brothers and cooked its books, according to the lawsuits. Detroit police threatened to arrest protesters, but never did so. Detroit Eviction Defense, www.detroitevictiondefense.org; 313-740-1073 Click on DED fliers for facts on illegal taxes and foreclosures, City Council proposal, etc. It’s absolutely ludicrous to ask city retirees who own property to donate to another pension fund when theirs has been impaired! What’s wrong with these people!? ?